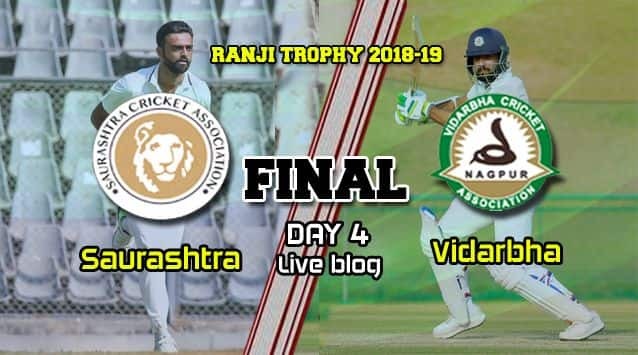 Hello and welcome to our live coverage of the Day 4 of the ranji Trophy 2018-19 final between Vidarbha and Saurashtra being played at the Vidarbha Cricket Association Stadium, Jamtha, Nagpur. 5:00 pm IST: So Vidarbha have placed themselves nicely to defend their title having reduced Saurashtra to 58/5 in 28 overs in chase of 206 runs. Aditya Sarwate has been the wrecker-in-chief with three wickets while Umesh Yadav and Akshay Wakhare have chipped in with a wicket each. Vishvaraj Jadeja (23*) and Kamlesh Makvana (2*) are the two unbeaten batsmen. Do Saurashtra have a fight left in them or have Vidarbha sealed the title? Join us again for a fascinating fifth and final day’s play tomorrow. 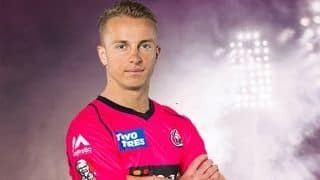 4:35 pm IST: Vidarbha on top as Saurashtra lose five wickets for just 56 runs. Akshay Wakhare removes Sheldon Jackson for 7, while Umesh Yadav gets rid of Arpit Vasavada. 12: 00 am IST: That’s lunch on Day 4 – Fantastic session for Saurashtra, that’s a Ranji Trophy winning session by them. Vidarbha limp to 125/6, taking the lead to 131. 10: 30 am IST: What a session this is turning out for Saurashtra, they have grabbed three big Vidarbha wickets for just two runs. Two wickets for Dharmendrasinh Jadeja and one for Jaydev Unadkat. After the fall of Jaffer, Jadeja picked up Ganesh Satish for 35 and then Unadkat sent back Akshay Wadkar for a 11-ball duck with a peach of a delivery. Vidarbha struggling at 73/5, lead Saurashtra by just 79 runs. 10:10 am IST: Big big wicket for Dharmendrasinh Jadeja. Wasim Jaffer nicks one to substitute wicketkeeper Avi Barot and he departs for 11. Big blow this for Vidarbha as they found themselves at 72/3, leading Saurashtra by 77 runs. 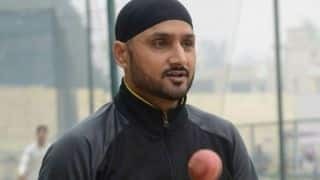 However, what followed after both Patel and Mankad’s dismissals was an extraordinary fightback by Saurashtra’s tail, which batted out two sessions including the extended one in the morning. Vidarbha tired all their options but could not break Unadkat and Sakariya’s dogged resistance.